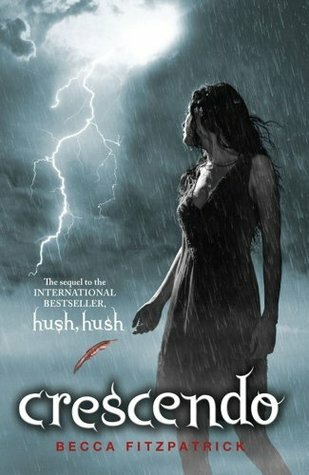 I loved Hush, Hush so very much when I read it that I was eager to know what happened to Nora and Patch! When I had the opportunity to review this early, I snatched it up! In order to describe my feelings about this book accurately, I have described a few key changes in character behaviors. If you think this is a spoiler, please don't read on. I don't want to ruin the story for you at all! First off I'll admit that I had huge expectations for this book, which we should all remember is always dangerous when you're reading to review. If you'll recall, Nora was one of my favorite protagonists back when I read Hush, Hush because she was so amazingly self-sufficient and stubborn. Her relationship with Patch was one that intrigued me. The two of them were so stunningly different, and yet they seemed to mesh perfectly together. Becca Fitzpatrick had me smitten with her book and eager for more. That being said, I'll start out by saying that I was a little disappointed with Nora in this book. She went from being a girl with an extremely intelligent head on her shoulders, to something completely different. She was constantly in need of someone to save her, unable to make good decisions, and frustratingly driven by her emotions. Nora was so completely involved in all things Patch that it was almost as though she lost an important part of herself. Now I will admit that in the grand scheme of the story, this made a bit of sense. Nora was being handed quite a bit to deal with. However since her character is what made me love the last book so very much, I was thrown off. As for Patch, well it should be known that I love Patch. Despite his bad boy exterior, he always had Nora's best interests at heart. In this book however it was a lot harder for me to love him. His coldness towards Nora, although necessary, really hurt me and I could understand how it would hurt her as well. It was a little easier for me to deal with his behavior, because of how it fit into the overall story line. I suppose it's never easy for a reader to loose what they love about a particular character, so I shouldn't be too terribly upset. Patch still remains one of my favorite love interests in a story. One fabulous thing is that the change in Nora and Patch's behavior allows for new characters to be introduced, and this adds a whole other layer to the story. I can definitely attest that I loved the story line in this book even more than the last one. It was dark and it was driven. Once the story really got going I was able to forget my initial worries and just get lost in the roller coaster ride that is Becca Fitzpatrick's writing! She is a master at giving you just enough to keep you reading, and then building slowly up to a climax. I will honestly say that, just like it's predecessor, Crescendo is a well paced and amazingly written story. There is never a dull moment in the book, and honestly the 400+ pages in this book just fly by. There are many new challenges presented to Nora and Patch in this sequel. In fact, there were times when I was a bit overwhelmed at everything they had to deal with. Without a doubt, this is one of the most engrossing reads I've had in a while. I sat down to read for an hour or so, and when I looked up it was 4 hours later and I had 20 pages to go. If that isn't the merit of a good book, I'm really not sure what is! Despite my minor annoyances with new character behavior, I really did enjoy devouring this book. As I said before, it's the type of book that will have you reading well into the night. Do not start this book before bed time, especially if you need to be up for work. You've been warned! For those who loved Hush, Hush as much as I did, go into Crescendo with an open mind and heart and I know you'll find you enjoy it immensely as well!